Why do Appraised Values Change from year to year? How do I Question the Appraised Value of my property? What is SAVE OUR HOMES? How can the assessment of my homestead property increase even when there has been a reduction in my fair market value? How can I report exemption abuse? What are the details of Amendment 1? What is the "Save Our Seniors" Exemption? What Other Exemptions can I file for? What other Property is Entitled to Tax Exemption? How may property Qualify for an Agricultural Classification? What are the Guidelines for Agricultural Classification? What is the Citrus Health Response Program (CHRP) Abandoned Grove Initiative? Who are the Taxing Authorities for Lake County? That is the Property Appraiser's job. He is an appraiser of property. It's not quite that simple, however, because he has to find what this value would be for every piece of property in the County, no matter how big or how small, on the appraisal date, which is January 1 of each year. In fact, he has to find the values for over 170,000 individual parcels of land and the buildings on them, many acres of citrus land, thousands of acres of pasture and farm land and 33,000 personal property accounts. In addition to appraising property the Property Appraiser must administer over 78,500 homestead exemptions, determine the eligibility for certain religious, charitable, educational and municipal property tax exemptions as well as administer widow, widower and disability exemptions. When market value changes, naturally so does appraised value. For instance, if you were to increase the total market value of your property by building a swimming pool in your backyard, the appraised value would increase proportionately. Similarly, should your property's value be decreased by fire, the appraised value would decrease to show the downward effect of this damage on the market value of your property. The Lake County Property Appraiser has not created this value. He simply has the legal responsibility to discover it as it exists and appraise the property accordingly, since people make value by their transactions in the marketplace. If your opinion of the value of your property differs from the Property Appraiser's Appraisal, you are encouraged to come in and discuss the matter with us. Also, If you have evidence that the appraisal is more than the actual fair market value of your property, we will welcome the opportunity to review all pertinent facts. After talking with us, if you still find a significant difference between our appraisal and what you feel your property's market value is, you may be heard before the Value Adjustment Board. A written application must be filed with the Clerk of the Board of County Commission. Applications may also be obtained from the Property Appraiser's Office. The Value Adjustment Board has no jurisdiction or control over taxes or tax rates. Their one and only function is to hear evidence as to whether or not properties called to their attention are appraised at more or less than their market value. If such is the case, the Board has the authority to change the appraised value. They cannot change your appraised value for any other reason. The Board can also hear appeals on denial of exemptions and agricultural classifications. Please see us first. The Property Appraiser and his staff are at your service, and will be glad to assist in all matters pertaining to County Appraisals and Exemptions. The Property Appraiser's office reminds you that our office is your office, so feel free at all times to visit and examine our records. Save Our Homes was implemented for the first time in 1995. The 3% homestead property assessment limitation is a constitutional benefit approved by Florida voters in 1992 which places a limitation of 3% on any annual assessment increases on homestead properties in Florida. In 2008, a constitutional amendment was passed allowing for Homesteaded homeowners to transfer their existing Save Our Homes benefit to a new homestead, up to $500,000 or the same percentage of value, whichever is lower. Please note that this cap does not apply to any new construction, any previously non-assessed improvements, or to the new owner of a new or existing home the first year they are added to the tax roll. The ability to transfer up to $500,000 of accumulated Save Our Homes “savings” from an existing or prior homestead property to a new homestead property within two years of abandoning your existing or prior homestead. Portability was made possible with the passage of Amendment 1 to the State Constitution in 2008 by Florida voters. The Save Our Homes “savings” is the difference in Market Value and Assessed Value. This is the amount which has been “protected” or “untaxed” due to the benefit of the Save Our Homes 3% assessment limitation or “cap”. Every person who has the legal or equitable title to real estate and maintains it as his permanent residence (i.e., is a legal Florida resident) or as the residence of another legally or naturally dependent upon the owner shall be entitled to $25,000 homestead exemption. In 2008, a constitutional amendment was passed creating an additional homestead exemption of $25,000 for home values above $50,000. School tax levies are exempt from this exemption. File an Affidavit of Florida Resident with the Clerk of the Circuit Court. Present proof of regular Florida driver's and automobile licenses. Resident aliens must have a residency (green) card in addition to items 2 and 3 above. You must have legal or equitable title to the property on or before January 1st and as of January 1st reside therein. Under current Florida Law property receiving a homestead exemption also receives an additional exemption known as Save Our Homes. Save Our Homes limits the increase in the assessed value of your homestead property from year to year. The limitation percentage is linked to the Consumer Pricing Index. The maximum increase in assessed value from year to year is 3% as long as no change has been made to the property or in ownership. This limitation causes the fair market value to be different from the assessed value. As long as the fair market value of the homestead property is greater than the assessed value, then the assessed value must be adjusted upward. This occurs even when the fair market value drops but there is still a difference between the fair market value and the assessed value. Please click here for an example of how Save Our Homes would cause this issue. If you know of a property in Lake County currently receiving a tax reduction from a homestead exemption or an agricultural classification, which you believe should not be receiving such reduction due to an abuse of the law, we urge you to report the property by filling out the online form or calling our Exemption Department at (352) 253-2154. Amendment 1 is the constitutional amendment voted in by Floridians on January 29, 2008. This amendment has provisions for Portability, Additional Homestead Exemption, Non-residential Assessment cap and a $25,000 Tangible Personal Property Exemption and is retroactive to January 1, 2008 (excluding the assessment cap). Portability - Homesteaded homeowners may transfer their Save Our Homes benefit to a new homestead, up to $500,000 or the same percentage of value, whichever is lower. Additional Homestead Exemption - An additional exemption of $25,000 for home values above $50,000. School tax levies are exempt from this exemption. Assessment Cap - An assessment growth limitation of 10% for all non-homesteaded properties. School tax levies are exempt from this limitation. The assessment cap does not go into effect until 2009. Tangible Personal Property Exemption - An exemption of $25,000 for all tangible personal property. Seniors that qualify receive a $50,000 exemption on county taxes, and a $25,000 exemption on city taxes for participating municipalities. To file for a Widow's/Widower's Exemption you must be a legal resident and a widow/widower prior to January 1st of the tax year and bring proof of your spouse's death. Divorced or remarried persons do not qualify for widow's/widower's exemption when their former spouse dies. F.S. 196.101 provides that real estate used and owned, as a homestead by a quadriplegic is exempt from taxation. The homestead of a paraplegic, hemiplegic or any other totally and permanently disabled person, who must use a wheelchair for mobility or is legally blind and CAN PRODUCE A CERTIFICATE OF THIS FROM TWO PROFESSIONALLY UNRELATED LICENSED FLORIDA DOCTORS OR THE VETERANS ADMINISTRATION, and the income of all persons residing upon the homestead does not exceed a specified amount including Social Security benefits*, shall be exempt from ad valorem taxation upon the homestead. F.S. 196.081 provides that real estate used and owned as a homestead by a veteran (or that veteran's surviving spouse if the veteran is deceased), honorably discharged with a SERVICE CONNECTED total and permanent disability and having a letter from the U.S. Government or U.S. Veterans Administration of this disability shall be exempt from ad valorem taxation. *Call the appraiser's office (352-253-2150) for the specific amount of income. To be wholly or partially exempt from ad valorem taxation, property must be used exclusively or predominantly for charitable, religious, educational, governmental, literary or scientific purposes. All property owned and used exclusively for exempt purposes shall be exempt from ad valorem taxation. All property owned and used predominantly for exempt purposes shall be exempt from ad valorem taxation to the extent of the ratio that such a predominant use bears to the non-exempt use. No application for exemption may be approved for religious, literary, scientific or charitable use of property until the application has been found by the Property Appraiser, or upon appeal by the Value Adjustment Board, to be non-profit as defined in F.S. 196.196. "Educational institution" means a federal, state, parochial, church, or private school, college, or university conducting regular classes and courses of study required for eligibility to certification by, accreditation to, or membership in, the State Department of Education of Florida, Southern Association of Colleges and Secondary Schools, or the Florida Council of Independent Schools. To qualify land for an Agricultural classification (greenbelt), an application must be filed with the Property Appraiser between January 1st AND MARCH 1st of the tax year. Only lands, which are used for Bona Fide Commercial Agricultural Purposes, shall be classified agricultural. "Bona Fide Commercial Agricultural Purposes" means good faith commercial agricultural use of the land. Lands which are not being used for, or diverted from, agricultural use. Land that has been zoned non-agricultural at the request of the owner. Land on which a subdivision plat is recorded. Land which is purchased for a price three or more times the agricultural appraisal placed on the land. In addition, the Board of County Commission may reclassify land to non-agricultural when there is contiguous urban or metropolitan development and the continued use of such land for agricultural purposes will act as a deterrent to the timely and orderly expansion of the community. January 1st is the statutory assessment date; therefore the property must be in use as bona fide COMMERCIAL agriculture on this date. All applications are field checked systematically to verify use and to ensure correct assessments. Additional information will be requested from the property owner to determine continuance of eligibility. This information will probably be in the form of IRS returns, income and expense documents, purchase or sales receipts and will be requested on a regular basis. Any residence on the property causes a minimum of one acre to be removed from the agricultural classification. This portion of the property is assessed at the current market value and is referred to as a home site and may be eligible for homestead if the owner qualifies under Chapter 196, F.S. Only the acreage that is actually used for the agricultural operation can be classified agricultural. Intent to use it cannot be considered. Sale of land for a purchase price which is three or more times the agricultural assessment placed on the land shall create a presumption that such land is not used primarily for bona fide agricultural purposes. Upon a showing of special circumstances by the landowner demonstrating that the land is to be continued in bona fide agriculture, this presumption may be rebutted. Application for agricultural classification must be made every year between January 1st and March 1st. The initial application is made on the long form (DR-482) and is available in the Property Appraiser’s Office or on our web site, www.lcpafl.org. If the application is approved, you will receive notification by July 1st. If the application is denied, you will receive your copy of the denial no later than July 1st. Once an Ag application is approved, you will receive a renewal card at the beginning of each year. Please read this card carefully, note any changes, sign and date it, and return it to the Property Appraiser’s Office prior to March 1st. Even if the classification has been renewed, the application can still be denied if the operation does not meet the proper criteria from year to year. The appraiser’s office MUST be notified of ANY change in the agricultural use or status of the property. When the property is sold, or when the name of the owner is changed in any way, the agricultural classification is automatically removed and a new application must be made on the long form (DR-482). A cooperative between the Florida Department of Agriculture, Florida Citrus Mutual, property appraisers and landowners has begun to identify abandoned groves. Groves that are registered under the Citrus Health Response Program (CHRP) maybe eligible for agricultural classification for up to two years when removing living citrus trees that are not actively managed for citrus (abandoned groves) and may act as a harbor for citrus pests and diseases. Once abandoned grove pest threat is eliminated, the property owner is eligible for a CHRP abandoned grove compliance agreement. CHRP abandoned grove compliance agreements will be valid for a minimum of two years and may be extended in one-year increments based upon a written request justifying the need for additional time to complete land use transition. For more information contact the CHRP office in Tavares by calling (352) 253-4547. Tangible Personal Property is everything used in a business other than items of Real Estate. Known as Business Personal Property, it includes: machinery, equipment, furniture, fixtures, signs, window air conditioners, supplies, leased, loaned, borrowed, or rented equipment and manufactured home attachments on rented land (cabanas, carports, etc.). Every person, firm, corporation,etc., owning, leasing, managing, having control or custody, direction or supervision of any tangible personal property in Lake County is required to file a Return. All tangible personal property returns must be filed prior to April 1st of each year to avoid penalties. Penalties may be imposed for failing to file, or improper or late filing of a Tangible Return. Filing after due date - 5% per month. Failing to properly file - 15% of corrected value. Failure to file a return or to otherwise properly submit the property for taxation does not relieve the taxpayer of any requirement to pay all taxes assessed against the property. Explain the layout of the Truth in Millage (TRIM) Notice. Your TRIM Notice is NOT a tax bill; it simply is intended to notify you of any changes in the valuation of your property and of the proposed taxes that may appear on the November Tax Bill. Remember: If you have any Additional Homestead, it DOES NOT apply to the taxes you pay to Schools. The Senior Exemption ONLY applies to the County taxes and the City taxes of Clermont, Lady Lake, Mount Dora, Minneola and/or Tavares. 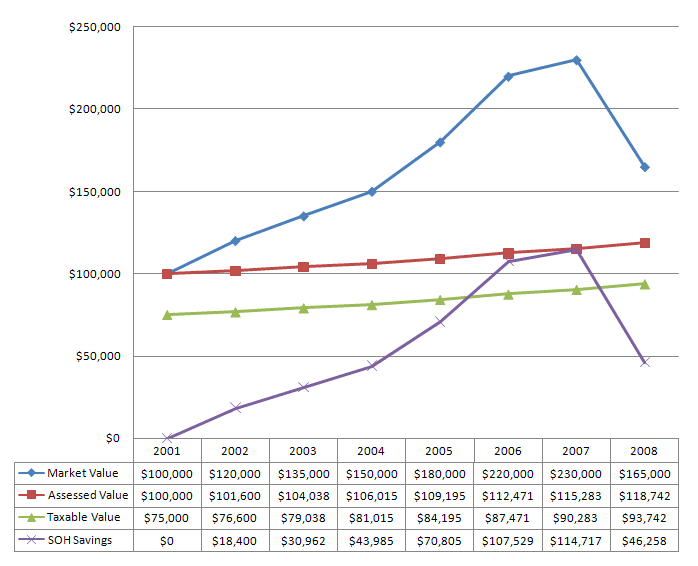 Market Value is the value your property could have expected to sell for as of January 1, 2011. Market Value is also considered a value not forced upon either the seller or the buyer, a sale price not under duress or threat of financial problem. See the the Tax Collector's Taxing Authorities page for a list of Lake County Taxining Authorities and their contact information.